• Collaboration: We work in partnership with a wide array of individuals and associations to advocate for all children and families. • Commitment: We are dedicated to promoting children's health, well-being, and educational success through strong parent, family and community involvement. • Accountability: All members, volunteers and partners have a shared responsibility to align their efforts toward the achievement of our association’s goals. • Respect: We value the individual contributions of members, volunteers and partners as we work collaboratively to achieve our association’s goals. We expect the same high quality of effort and thought from ourselves as we do from others. PTA is a place for parents to have an impact on their children's educational lives and there is a place in Meadow Pond PTA for every member. Our PTA sponsors many events during the school year. Some events are family activities with the goal of bringing families together to share a good time. Some educational events are enjoyed by the children during school hours and some events are PTA fundraisers. Your participation in PTA shows your child the value you place on education, volunteerism and leadership. PTA meetings are a place to learn more about PTA and Meadow Pond Elementary including the faculty, other parents and programs. PTA meetings provide a forum to share your thoughts and vote on important issues. Please come to a PTA meeting and see what MP PTA is all about! Why You Should Support the PTA? Stay Connected. There’s no better way to stay connected about what’s happening at MPES. We send out a weekly e-newsletter on Sundays to keep you up-to-date. Also, PTA members receive access to our online School Directory and one copy of the paper School Directory (unless you want another for $5). Tap into our Network. PTA functions are opportunities to meet other parents and teachers and to discuss any issues that are on your mind. You can share ideas, concerns, and experiences. Witness Improvement. Our PTA plays an important role by supporting our children through enrichment activities like field trips, author visits and special in-school programs, classroom funds for teachers, parent programs, clubs such as Kindness Club and Garden Club, school yearbook, class picture day and fun family events like Welcome Back Picnic and Halloween Spooktacular... just to name a few. You Become a Role Model. Be PROUD and carry the card! By supporting the PTA you becoming a member, you’ll be demonstrating to your child the importance you place on education and how each child has a voice that deserves to be heard. Enjoy Substantial NYS PTA and National PTA Benefits. By supporting the Meadow Pond PTA you also support NYS and National PTA. Take advantage of a host of benefits including discounts from member benefits providers, magazine subscriptions, leadership training, e-newsletters and much more. See and you thought you were just supporting the local PTA?! 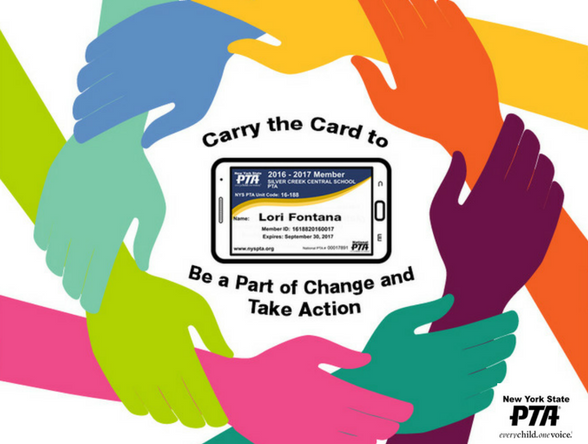 Please support our PTA by become a member today! Join right now at Online Membership Registration (no processing fee) or.... use PTA Membership Form (.pdf) & send in with $20 cash/check through backpack mail to "PTA Membership Mailbox". We will enter your information into the NYS PTA online system & then your e-card will be emailed to you. You will also receive one vote in PTA matters, PTA volunteer insurance coverage, immediate access to online version of MPES School Directory and one copy of paper version of MPES School Directory. A second copy of paper directory can be provided for an additional $5 PTA donation. Once you join the PTA you are not required to volunteer for anything, but we'd love it if you did!